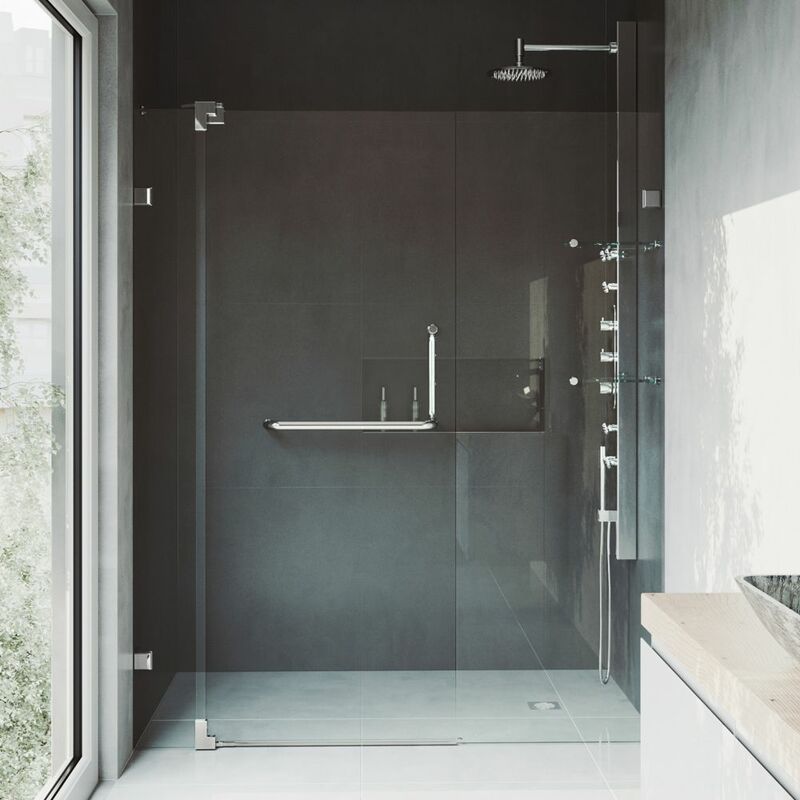 Clear and Brushed Nickel Frameless Shower Door 66 Inch 3/8 Inch glass Experience fine quality combined with superior design in a VIGO frameless shower door. Single water deflector redirects water toward the inside of the shower. Side and door clear seals keep the shower watertight between wall and glass door or fixed panel. Clear and Brushed Nickel Frameless Shower Door 66 Inch 3/8 Inch glass is rated 4.6 out of 5 by 88. Rated 5 out of 5 by BillS from Fabulous Alcove Shower Solution This is the second Vigo Shower door product that I have installed and would recommend to anyone doing a shower remodel or new installation. The hardware and glass are of high quality and are easy to install when following the clear instructions. Thank you for a wonderful product. Rated 4 out of 5 by Stuck with the door from Nice Door but issues exist We bought this door 2 months ago and it was professionally installed by an excellent contractor. The bottom seal on the door fails to keep water from getting under the door when the shower is used. My contractor has checked the seal and it is installed to spec. For a door this expensive I certainly did not expect to have water get under the door when using the shower! Take a look at this picture. Rated 5 out of 5 by Isneir from Was a awesome addition to my bathroom renovation. ... Was a awesome addition to my bathroom renovation. Rated 4 out of 5 by Snodgrass from Very nice design Looks great. I omitted side plastic seals and threshold for a cleaner look. Screws provided are not sufficient to hold door. Pay attention to getting left or right door - not interchangeable. Documentation has some errors and lack of clarity. 2 person install. Rated 3 out of 5 by Plumber from Love the door (not the LEAKS) Had this door installed about 6 months ago. I really love the function and the looks of the door. But as far as it leaking, not so much. The door leaks water at the base of it every time we use it. I’m not sure how it is getting to the outside but it does. Rated 4 out of 5 by Brandon K13 from Thick glass , hardware could be better Glass in thick and durable . The hardware appears beautiful and is almost red in color at certain angles . Some of the pieces ( strip that goes accross bottom ) started chipping in areas ( from door sweep catching ) . Frameless doors do Leak and that is not brand specific . They all do ! . Nothing you can do but be careful . The door Itself is beautiful and can tell it will last awhile . I did call Vigo directly and they sent me a new piece that was chipping . However , this shouldn’t be happening . Rated 5 out of 5 by tonyio from Clean design We purchased this door a year ago and we absolutely love it. We wanted the clean look of a frameless door, and this model lived up to the bill. If you have a small enclosure that you want to freshen up, this adjustable door is for you!